he castle was a fortified building or set of buildings used to provide permanent or temporary protection and accommodation for kings and queens or important noblemen and their families. The castle provided the centre for political and administrative power for the region. The term castle usually refers to the wooden and stone fortifications and buildings constructed during the medieval period. The noblemen did not stay in the same castle all year round but tended to move from place to place depending on where their attention was required. Each nobleman and especially a king had a lot of people also travelling with him. All of these people needed to be housed and feed. 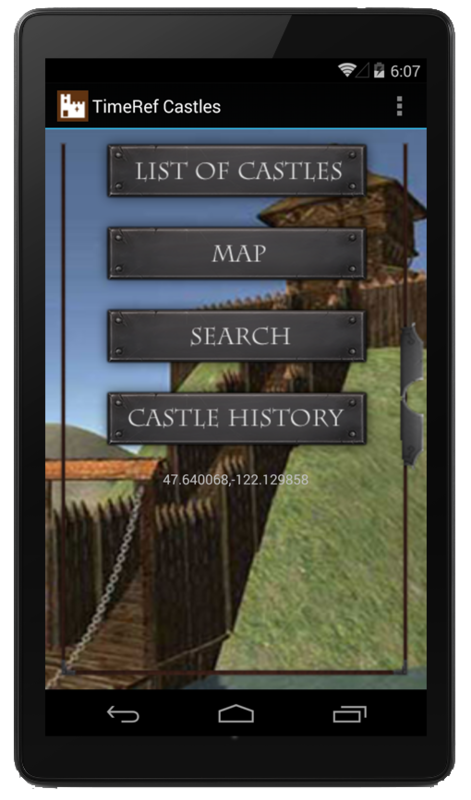 The castle had to provide enough accommodation for the nobleman or king and his party when they stayed at the castle. When the king was elsewhere only the number of people required to look after the castle and to guard it actually lived there. Why build and live in castles? Danger of invasion by enemies from another country. During the early years of the tenth century (900-925), the threat from Viking invasion was great and so Edward the Elder and his sister Ethelflead, Lady of the Mercians, organised the fortification of many towns , including Shrewsbury, Bridgenorth, Tamworth and Warwick. What form the fortifications took is not known as no records survive. Stone may have been used where it was available, but most likely it would have been ditches and wooden palisades that surrounded the towns. Much later on, in the first half of the sixteenth century, Henry VIII built several strongholds along the south coast of England to defend against an invasion from France. But these fortifications can be described as forts rather than castles as they were not designed to be lived in by the royal family or the barons. Of the three dangers listed here the threat from civil war or the need to control the population were the main reasons that the majority of castles were built in Europe. Although foreign invasions did occur not many castles can be said to have built because of the fear of foreign invasion. Those that were are on the south and east coast of England such as Dover and Portchester. Danger from rival groups within the country during a civil war. The barons who were upset by the king's rule. Opposing branches of the same royal family. During the period known as the Anarchy, a conflict between King Stephen of England and Matilda the daughter of Henry I, castles were held by loyal supporters of one or the other side. Castles were besieged and captured. The castle became such a powerful place that barons who controlled one or more castles were a serious threat to the King. After the civil war between Stephen and Matilda, Henry II ordered the destruction of many castles and confiscated many more to make it harder for rebel barons to oppose his rule. Danger from an uprising of the ordinary population of the country. After the Norman invasion of Britain in 1066 the Normans constructed a large number of motte and bailey castles across the country. William the Conqueror and his trusted barons built these castles to control the country's newly subdued inhabitants. William feared an uprising by an unhappy population who outnumbered their Norman conquerors. The castles were required so that the Normans could remain safe and in control. Major castles were built in or near large centres of population. On the edge of London William the Conqueror had a massive square keep constructed as a reminder to the Londoners that he was their king. Similarly castles were built in Exeter, York and at other important medieval cities. 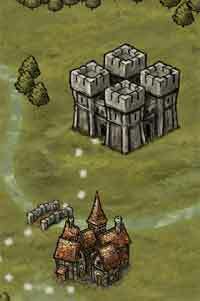 William also built castles at strategic locations such as important river crossings and crossroads. Before stone castles were constructed, many Norman barons and Saxons theges lived in wooden halls. These halls varied in size and were designed like a church is today with internal columns that supported the large timber rooves. These columns divided the length of the hall into sections known as bays. The safest place to be was this large timeber hall and so the whole household of the lord, including his family and supporters lived together within it. Bays were partitioned off and animals could also be housed within the hall. The majority of Norman barons, including the Kings, built small forts made from wood consisting of a strong perimeter palisade set on a high bank surrounding the bailey where the buildings for the household were located. Outside the fort a deep ditch was dug which was sometimes filled with water. Most of the time these forts were a sufficient means of defence, but if attackers got over of through the palisade there was nowhere for the defenders to retreat to. To overcome this limitation the keep was developed. 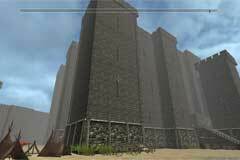 The keep was a particularly strongly built building made of wood and later stone. 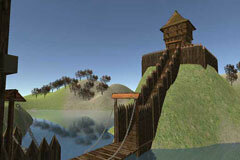 Further developments in castle design saw the keeps built on top of large mounds called mottes. The stone keep was at the heart of the castle and was the most fortified part having several floors and strong defences. The introduction of keeps resulted in the separation of living areas for the King or Lord and his family away from their servants. There was a range of accommodation in a castle for the range of people who lived in it. The King and Queen would have had the most comfort having private chambers in the keep. As well as chambers for the King, the keep had a 'great hall' used for banquets and meetings. Below the hall were large rooms where the knights and the king's guards would have slept and eaten. Most people would have slept on the floors rather than in beds and all in the same large room. There was not much privacy. 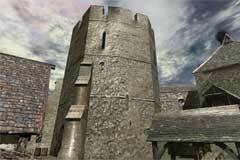 Some castles did not have a central keep but had strong towers built along the curtain walls. One or more of these towers would have been used in place of the keep. Accommodation was provided for the castle workers in the bailey. The bailey is the area inside the castle walls. In a few castles the kitchens were built in the keep but in most castles the kitchens were in buildings outside in the bailey. When the king or lord was staying in the castle there would have been plenty of banquets and plenty of guests to feed. The kitchens had to be large and they had to have large fireplaces over which all the food was cooked. This included whole oxes or pigs which were roasted on spits over the open fires. Vegetables and stews would be cooked in large pots over the fires and they would have baked a lot of bread. In order to feed the many mouths of a busy castle, many had their own gardens and orchards where food was grown. They may have also had ponds stocked with fish. In normal times most of the food and drink used in the castle would have been supplied fresh from the surrounding land but anything that needed to be stored was kept in store rooms. Storerooms can commonly be found on the lowest floor of the keep. Because the walls of the keep at its base are at their thickest and the windows are only small slits that let little light in the rooms at the base of the keep were kept cool even in summer. Also, because the main entrance to the keep was on a higher floor, there was no access to the store room from outside the keep and this helped protect the supplies. Supplies were important when the castle was under siege and the more supplies a castle had, the longer it could hold out. A castle needed to have its own water supply. This was because in the time of a siege when it was not possible get supplies the people in the castle were assured of at least water to drink. Without fresh water the castle would have been forced to surrender much more quickly. Wells were constructed inside the castles, sometimes inside the keep itself so that the keep could be held against the attackers even if the outer walls of the castle had fallen. As horses were the main method of transport in medieval times it was important to have them kept safe within the castle walls. As mentioned above the storeroom within a keep can be found on the lowest floor and normally could not be accessed directly from outside the keep. Most castles had a dungeon to hold prisoners and the dungeon needed to be escape-proof. In the diagram the dungeon is built into the lowest floor of the castle and the only way into it would be through a trap door from the floor above. The prisoner would be lucky to have a small window to let some light in. The entrance to the keep of the castle was usually on the first floor through the forebuilding and not at ground level. 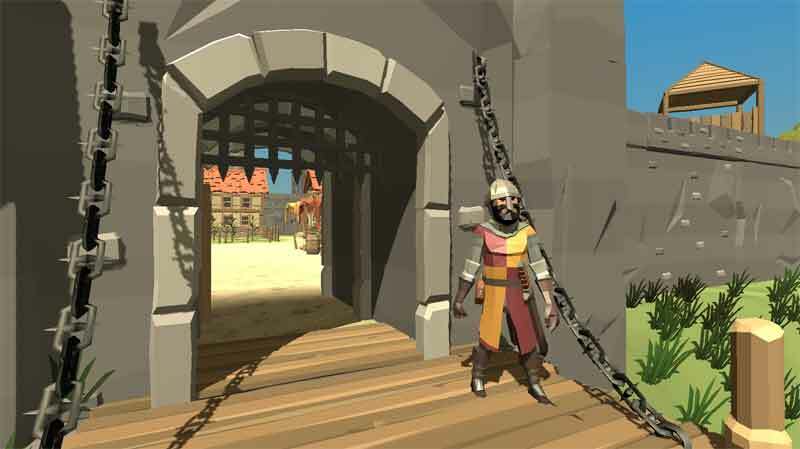 This made it easier to defend as a drawbridge could be used. When the King or Lord was in residence his best knights could sleep and eat in this area guarding their master at all times. Toilets were simply holes in the floor that emptied through passages in the walls out into the moat or ditch around the castle. Designers of the castle had to be careful that attackers could not enter the castle through the toilet and so even the toilets were protected, either by making the holes too small to get through or too high to reach. In the small example keep shown here the majority of the second floor is taken up be the banquet or great hall. The great hall was were all the important meetings and banquets took place. Everyone eat at long tables sitting on benches apart from the nobles who would have had chairs to emphasise their importance. The nobles, their family and important guests would sit at the high table. Banquets would have taken hours with large numbers of courses of meat. Servants would serve the food. A small chapel is built into the forebuilding above the entrance and would have allowed the king or lord's family to pray without having to leave the keep. A chaplain may have also lived in the keep to provide spiritual support. On the higest floor of the keep is the safest and where the king or lord's family would have slept. They may have shared this space with servants. A door leads out onto the roof of the forebuilding where guards could keep a watch out for enemies. Above this floor is the roof. The keep would have a walkway all the way around for guards to keep watch and there may have also been extra small towers at each of the corners. Bailey: The open area in a castle between the keep and the curtain wall. Concentric: A concentric castle has a series of defences enclosing another. Constable: Person in charge of the defence of the castle. Crenellation: Notched battlements at the top of a wall. Ditch:: A trench dug around the outside of the castle. When filled with water is usually known as a moat. Keep: The defendable central part of a castle. Motte: A large earth mound either natural or artificial on which a keep is built. Palisade: Wooden wall surrounding the castle's bailey. 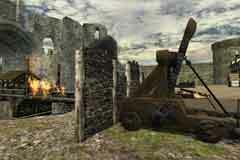 Siege: The blockade of a castle or town to force the surrender of the occupants.